I am SO excited to be a Guest Designer for Jaded Blossom today! I took advantage of this wonderful timing to make my step-daughters gifts pretty for Christmas this year. We do mail to her and I'm so thrilled to be ahead of the game this year! One little thing to tell you before we move on is that I've used papers from the same paper pack for these projects...an older retired SU! paper pack (isn't it adorable?). All stamps and dies (minus the bear) are from Jaded Blossom. One gift that we get her every year is a gift card. Being that she lives about 4 hours from us I think it is just better for her to be able to pick something she really wants and we encourage her to purchase something she would not normally purchase for herself...last year she got a beautiful Coach bag!. With that in mind I was super excited to use the new Folded Gift Card Die. Above is the outside of the gift card holder. 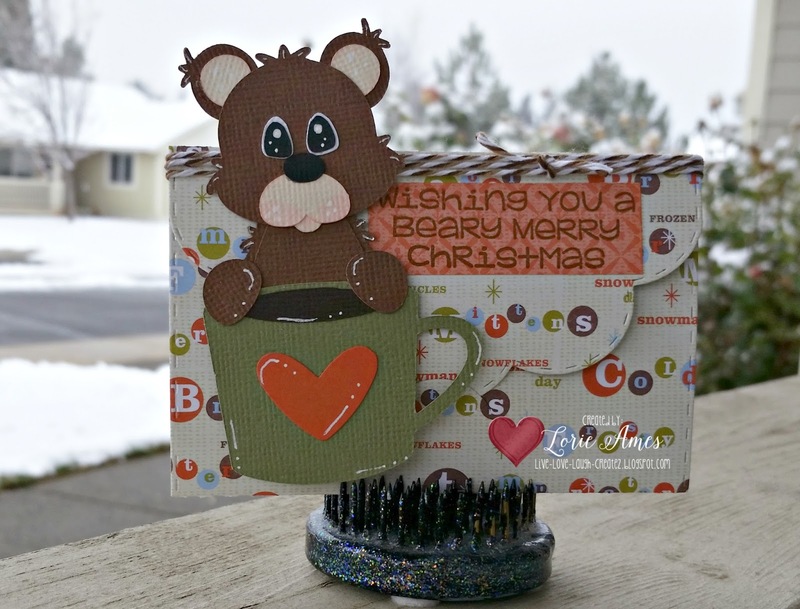 I gussied it up with a cute bear and coffee cup as well as a sentiment from the Season's Tweetings set. 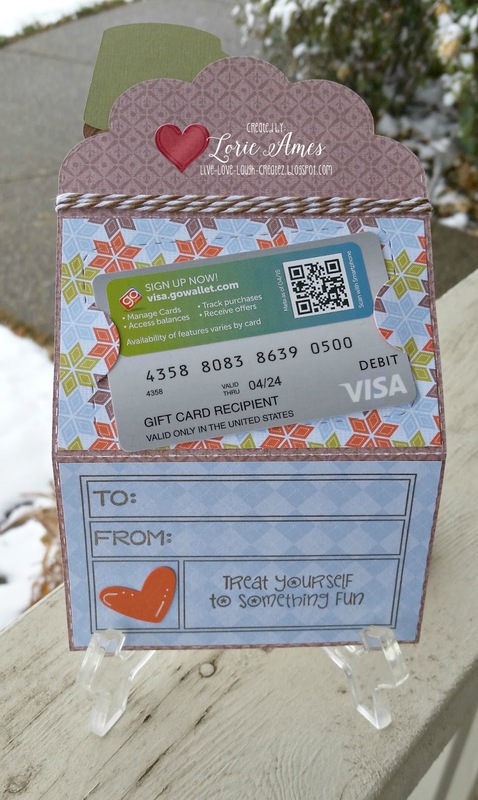 Inside this gift card holder is made special by using the template from the Fun Money set as well as a sentiment from the Gift Cards Galore set. The gift card itself is nestled into the holder with the Gift Card Die (which, by the way I put at an angle on purpose). In addition to the gift card (and another gift that will go unnamed just in case she reads this, though I doubt it) we got her some warm, comfy, plush socks to wear inside this winter. I made the belly band by just using a length of the pattered paper and gluing it together in the back. On top are circles from the Scalloped Circle and Stitched Circle Dies. The CaUTE sentiment is from the Holiday Pampering set. And finally I made a card to put into the box. This card uses a bunch of Jaded Blossom as well! I've used the Christmas Luggage Tag for the main sentiment which I cut with the Scalloped Circle and Stitched Circle Dies, the tree border and holly elements are made with the Christmas Dies. And there you have it! I think she is going to LOVE this set and I cannot wait for her to open it! Thank you to Candace and Michelle for having me today..I really had fun putting all of this together! These are all FABULOUS! 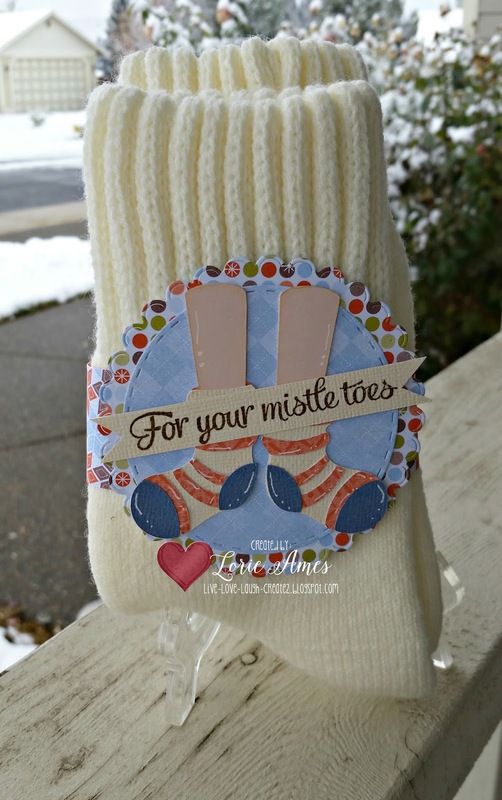 Love how you angled the gift card and the fun wrap on the socks! 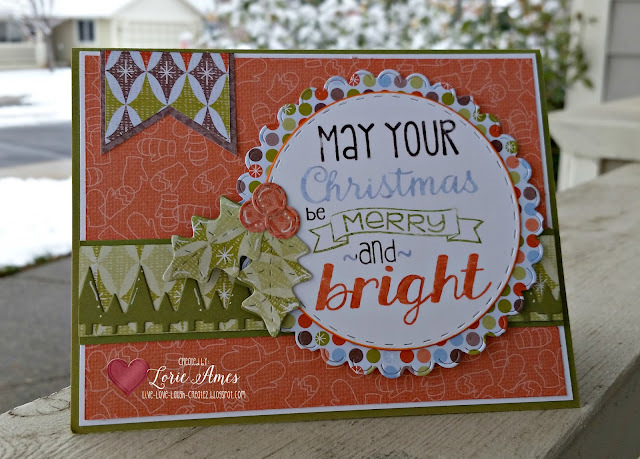 The card is beautiful and I love the papers used on all of these! Awesome job! Cute cute cute! Love all the details and the cute socks! You did an amazing job!! I love all the Jaded Blossom goodies you used!! WOW! Fantastic projects today! Great job Lorie! Such amazing projects!!! Awesome job! Lori, what a great job on all your projects! I love the gift card holder and the fun belly band for around the warm fuzzy's! Super cute card~Great job showcasing all the JB goodies to! Congrats on your GD spot!!! What awesome projects! I love your card and all the amazing details! How fun. She will love it. Outstanding job Lorie! Those socks look mighty cozy! Beautiful! You did a great job! I love the colors you used too! Great projects! I'm sure she loved them!